Pencil, Plan, Pen, Map, Print, City: Mechanical Drawing before the Age of the Computer exhibits drafting and design works from the last 100 years, arranged in terms of scale & medium: from pencil draftsmanship for hand-held props, fixtures, paintings and products; through scaled plans for theatre sets, light plots, dwelling units and interiors; all the way to printed, engraved or marked-up maps, plans and sections for public buildings, city neighborhoods, & urbanizing regions. 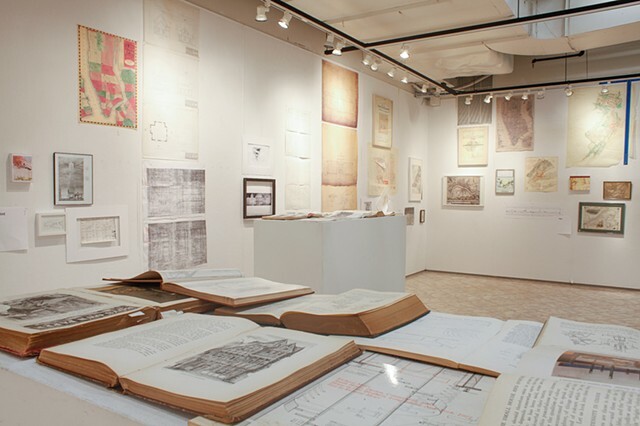 All the exhibited works show some degree of skill with mechanical drawing tools (some of which are also exhibited) like parallel rules, fixture templates, adjustable set squares, lead pointers, yellow tracing paper, lettering guides, engraving knives and french curves. Since the turn of the century, these tools and skills have been fast disappearing, and design students currently enrolled at Fordham may never reach the level of expertise exhibited. So the work installed elicited much admiration, but also a certain measure of relief.